New Delhi: On Wednesday, an illegal coal mine in Dhanbad district of Jharkhand collapsed, trapping several workers. Rescue operations are on, and four dead bodies have been recovered, as per reports. According to the local media, the number of deaths could be as high as 14, as several miners continue to remain trapped inside. 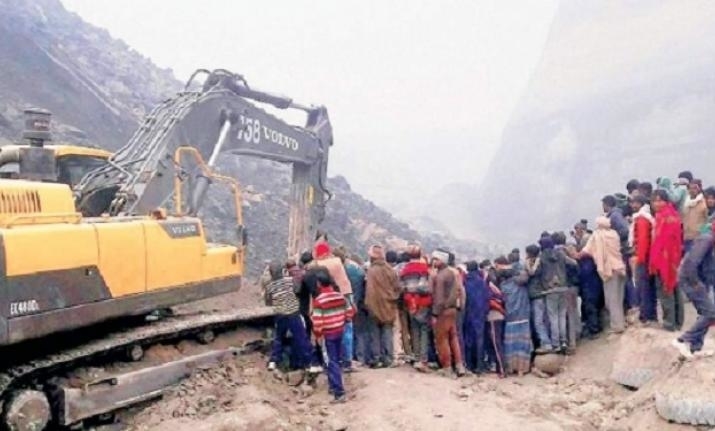 The incident happened at Kapasara open cast mines of Mugma area of the Eastern Coalfield Limited (ECL), a subsidiary of Coal India Ltd., where the poor people from the region illegally extract coal for the coal mafia on a regular basis to sustain their livelihoods. The mine had been outsourced by ECL to a private company, Kanta Transport. The outsourced mines of ECL in the area have become safe-zones for the local coal mafia, according to media reports. Alongside the private contractors who are responsible for maintaining the mines, the mafia allegedly also extracts coal using the local poor. It is also alleged that the local police, well aware of the going-ons, have decided to turn a blind eye to the matter. Sources said that as soon as the rescue operations started, the coal mafia tried to remove bodies from the mine in an attempt to nullify their involvement in the accident. But their attempts were curbed when the police arrived. Out of the four whose bodies have been recovered, there are three males and one female. Three of the victims have been identified as Shiva Dangal, Dinesh Paswan, and Kanta Remani. All of them were local residents. This incident happened just over a month after the rat-hole mining accident in Meghalaya’s Khlooryngksan area, when 15 diggers got trapped in a mine after it was flooded with the water from the nearby Lytein river. Forty days after the incident, the first body was retrieved in a heavily decomposed state on Thursday. This wasn’t the first mining accident leading to multiple deaths in Jharkhand. According to data from the Ministry of Labour and Development, between the year 2015 and 2017, the maximum number of mining deaths happened in Jharkhand. There were 377 mining deaths during the period, out of which Jharkhand accounted for the highest number - 69 - in accidents inside the mines. The number of accidents and deaths in mining keep rising as the poor are forced to work in abysmal conditions with promises of high wages. More often than not, they are threatened by powerful men running the mafia, say locals. According to data from the Director General of Mines Safety, there has been a 40% rise in miner deaths across the country. While the number of miners who died at work was 55 in 2016, the number rose to 94 in 2017. In 2018, till August-end, the country had seen deaths of 81 miners. According to a report by The New Indian Express, the number of fatal accidents in mining has risen since 2016. While the number was 54 in 2016, it rose to 67 the following year and 76 in 2018. Jharkhand topped the list in all the three years with 11 fatal accidents in 2016, 23 in 2017 and 31 in 2018. Why are the governments failing in the working class's issues?